it was the first truly lovely spring day of the year yesterday, perfect for lunch with good friends. 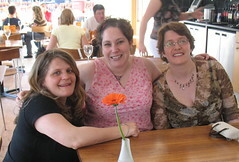 i met j & m in 1994 (fourteen years ago!) when we were all teaching english in japan. they are part of the reason i wanted to move to london. we don't see each other as often as we used to since none of us live in central london, but we made a pact to have lunch every four months or so. by the time we meet next, m will be mum to both baby v (who is not really a baby anymore) and his little sister/brother! It's so nice to see all 3 of you ladies together.